On 8 April 2016 the Government published the report from the independent review of Council Tax Support (CTRS) schemes it commissioned three years ago. 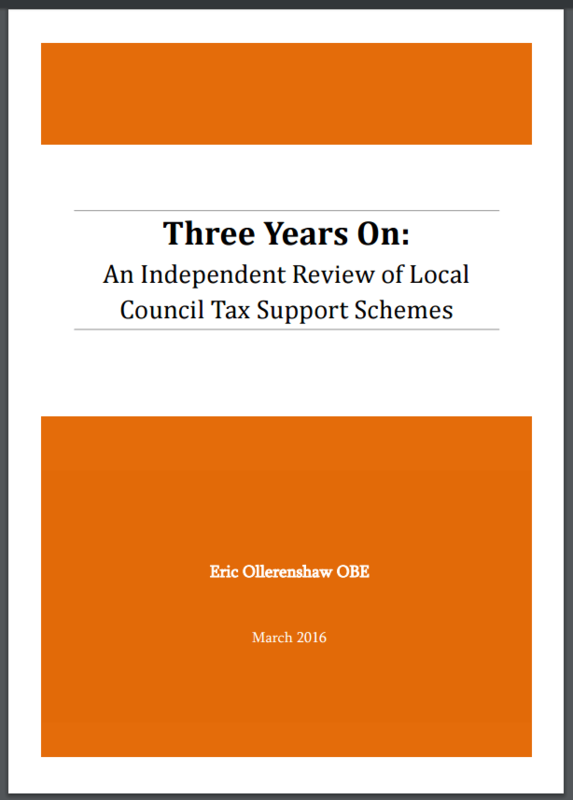 You can download the Independent Review of Local Council Tax Support Schemes here. Policy in Practice is heartened that many of findings and recommendations in the report chime well with the conversations we’re having with local authorities. Together with the Welfare Reform Club we have helped councils to design CTRS schemes that also consider the cumulative impact of welfare reforms on residents, one of the recommendations the report author, Eric Ollerenshaw, calls for. Policy in Practice supports this finding. In 2013 we called for local authorities to carry out detailed analysis of the impacts of their proposed CTRS schemes which has now been backed by the author of the report, Eric Ollerenshaw. Policy in Practice is working with over a dozen councils to help them model their prospective council tax support schemes, taking into account the cumulative impact of all other welfare reforms, as well as mitigating measures such as the National Living Wage. Given the uncertainty around the rollout schedule of Universal Credit, the report argues that Council Tax Support should not be integrated into Universal Credit at this time. Policy in Practice argues that local schemes introduce complexity into the benefit system, and council efforts could be directed toward supporting residents if support were centralised, as it is in Scotland and Wales. Learn more about our work on council tax support in our recent webinar, below, and read our blog post Nearly 75% of councils to cut CTRS budgets this April. For more information on the help we have given councils to create CTRS schemes please contact [email protected]. The report finds that councils have done well to implement schemes in a short space of time. Whilst the impact on arrears has not been as great as first feared, the councils we speak with are very aware that this may not always be the case. The growing cumulative impact of welfare reforms, combined with the knock on effect on other outcomes including indebtedness, make it difficult to predict the long term effects of welfare reforms. Council tax is costly to administer which is one reason why some councils have stuck to the original council tax benefit, albeit an ever smaller number of councils that can afford to. We are working with a number of councils across the country who have asked us to model the impacts, including financial and administrative, of simpler schemes, such as those that use income bands for assessments. The report finds that local councils carry the costs and risks, but only enjoy part of the funding and freedoms. The report calls for councils to have greater control over the Single Person Discount and protections for pensioners. In addition to this, it has not been possible for councils to identify how much funding Government is providing for LCTS schemes, all of which means that councils are limited in their ability to create the CTRS they want for their residents. One important consideration not covered in the report is the compounding effects of cumulative increases in council tax support of 3.99%. The ratcheting effect of this over multiple years increases the amount of cash that low income households have to find. We have asked the New Policy Institute to include further analysis of this in their next report in 2017. While savings, narrowly identified, are being found by councils, the report rightly finds that localised schemes introduce many hidden costs. Policy in Practice is modelling the impact of increased council tax liability for individual local authorities, alongside the cumulative effect of other welfare reforms and the impact of migration to Universal Credit on the financial administrative and social impacts of various options for council tax support. Streamline administrative processes by consulting on schemes only when changes are proposed, setting timetables consistent with councils needs and providing clearer guidance on consultation. Provide clear guidance on sharing Universal Credit information with Universal Credit with councils, in order to properly administer local schemes. Policy in Practice argues that this could also lead to better co-ordinated local support. Greater control for councils over the single person discount and protection for pensioners would lead to better targeted schemes. Central government should be clear about how much funding it is providing for council tax support from the revenue support grant, and councils should be required to report how much of this is passed on, in order to improve governance. There should be a forum to share good practice among local authorities. This is something Policy in Practice is introducing through its Leading Lights Network of local support organisations. Where possible, councils should work in partnership in designing future schemes. Councils should consider options around joint procurement of software providers, and joint schemes with neighbouring councils, where appropriate. Councils should ensure their debt collection practices remain in line with latest Government guidance, and that their processes are proportionate to the debt involved. Councils should consider signing up to the Citizens Advice “Council Tax Arrears: Good Practice Protocol”, developed in partnership with the Local Government Association. Departments and teams within councils should work closely with each other and with partner organisations to develop a holistic approach to LCTS council tax collection, identifying and supporting people who are struggling to pay. The report features a number of case studies. The case study of South Gloucestershire Council describes the experience of the only council thus far which has moved entirely away from an LCTS scheme based on CTB-style means-testing, and to a simpler system of using income bands to determine the level of LCTS support. Thorough and comprehensive consultation process, engaging members, public and partner organisations. Following this upfront investment in the core design of the scheme, the scheme can be easily adapted to adjustments the council decides to make in the future, such as, for example, protections for specific groups or band adjustments, and the scheme is more cost-efficient to administer locally. The Welfare Reform Club, the local welfare delivery consultancy, estimated that savings of some 30% could be achieved by moving to a discount scheme by 2019. South Gloucestershire Council remains happy to share their experience with other councils who are considering a simplified system of delivering LCTS. The report says “There were some concerns when Government announced plans to localise council tax benefit that this would lead to a system that lacks transparency.” The following case studies are highlighted as good examples of councils who have communicated changes to LCTS schemes and the available support well. Posters advertising the consultation and how to access documents were displayed in all council offices. Team of interns set up to call CTS customers during the first few months to explain the scheme and help customers set up flexible payment schemes. Harrow attributes its relatively high collection rate for LCTS recipients partly to its intensive and early engagement efforts in 2012-13, which included engagement with several thousand customers, the voluntary and community sector and with enforcement agencies. A case study of the work we did with Leeds City Council can be downloaded here. For more information on the help we have given councils to create CTRS schemes please contact [email protected]. CTR Schemes – benefiting councils or residents?